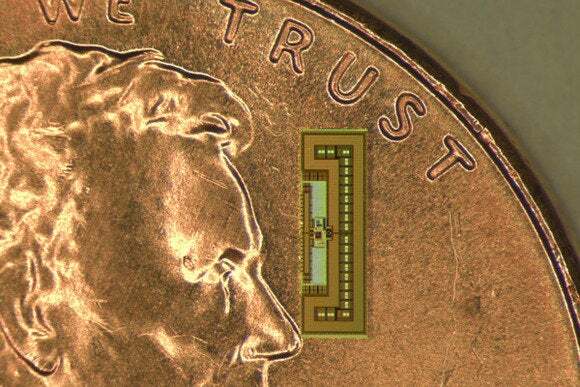 Engineers at Stanford University have developed a tiny radio that’s about as big as an ant and that’s cheap and small enough that it could help realize the “Internet of things”—the world of everyday objects that send and receive data via the Internet. Part of the secret to the radio’s size is its lack of a battery. Its power requirements are sufficiently frugal that it can harvest the energy it needs from nearby radio fields, such as those from a reader device when it’s brought nearby. RFID tags and contactless smartcards can get their power the same way, drawing energy from a radio source, but Stanford’s radio has more processing power than those simpler devices, a university representative said. That means it could query a sensor for its data, for instance, and transmit it when required.